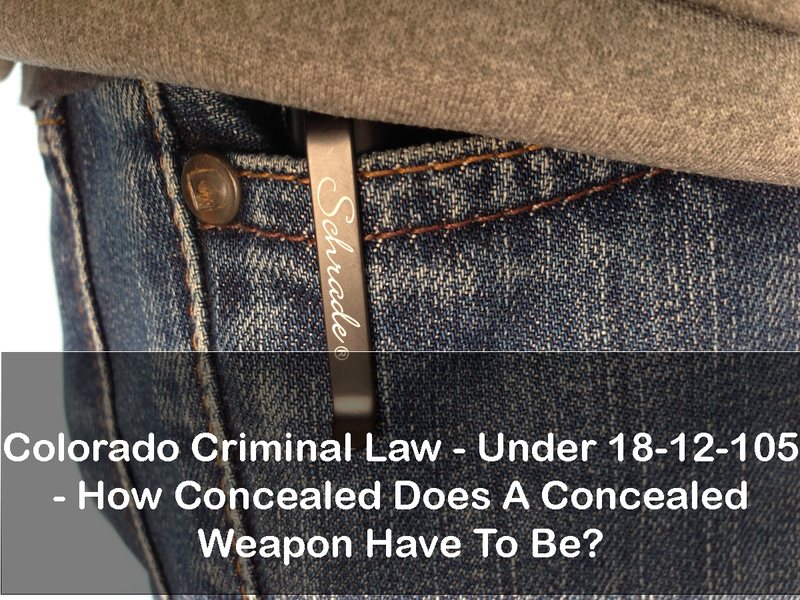 Colorado Criminal Law – Under18-12-105 How Concealed Does A Concealed Weapon Have To Be? 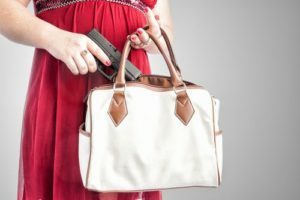 – Under Colorado law – carrying a concealed weapon can act as a violation of certain Court orders such as a protection order. Understanding the intersection of the two laws is important to prevent new charges of Carrying A Concealed Weapon and Violation Of A Protection Order. It is an understatement to assert that Colorado’s concealed weapons law is confusing. Having said that, that confusion can lead to new arrests for a variety of new crimes which include protection order violations. Colorado’s concealed weapons law appears straightforward on it’s face. of the general assembly is located. (f) A United States probation officer or a United States pretrial services officer while on duty and serving in the state of Colorado under the authority of rules and regulations promulgated by the judicial conference of the United States. If you study the statute above – you will see the most common defenses to the Colorado charge of carrying a concealed weapon actually “built into” the law itself – Sections (2) (a) – (f). 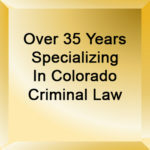 Colorado protection orders can be found in criminal cases and in also in certain civil cases – such as Colorado Dissolution cases. These orders of protection may include multiple “conditions” that, if committed, would violate the Court’s Order and will constitute the commission of a new crime. Colorado’s Violation Of A Protection Order Law (excerpted) 18-6-803.5(1)(a), C.R.S. (c) Violates a civil protection order issued pursuant to section 13-14-105.5, C.R.S., or pursuant to section 18-1-1001(9) by: (I) Possessing or attempting to purchase or receive a firearm or ammunition while the protection order is in effect; or (II) Failing to timely file a receipt or written statement with the court as described in section 13-14-105.5(9), C.R.S., or in section 18-1-1001(9)(i) or 18-6-801(8)(i). Understanding the nature of terms in the statute such as “possession” and “concealment” is critical to understanding the intersection of these two laws – the Colorado crime of violation of protection order and the crime of carrying a concealed weapon. In this case, the police officer had the legal right to search the juvenile’s backpack and when he did – he found a knife with a five and one-half inch blade inside a sheath inside a zippered compartment. The juvenile was found to have committed both the crime of violating a protective order and the crime of unlawfully carrying a concealed weapon and was adjudicated a juvenile delinquent. The primary issue in the case turned on whether the knife was concealed “on or about (the juvenile’s . . . person.” The juvenile’s argument – which must be well understood at this point – was that because the knife was in a sheath in an interior zippered compartment of his backpack, it was not readily accessible and therefore was not “on or about” his person. As used in section 18-12-105(1)(a), a “knife” means “any dagger, dirk, knife, or stiletto with a blade over three and one-half inches in length, or any other dangerous instrument capable of inflicting cutting, stabbing, or tearing wounds, but does not include a hunting or fishing knife carried for sports use.” § 18-12-101(1)(f), C.R.S. 2016. This is one of the more difficult issues in the case and bears closer analysis. The defendant argued that because his knife was in a sheath in an interior zippered compartment of the backpack, it was not readily accessible and thus was not “on or about” his person. The question then turned on what does “about the person” mean? Third: The juvenile was carrying the concealed knife in his backpack unlawfully because he was doing so in violation of a Court protection order even if that order was unrelated to the case at hand. Why did these facts support a violation of a Colorado protection order? Since the juvenile in this case did nothing directed aimed at the protected person named in the protection order how could he be found guilty of a violation of the protection order which was entered in an unrelated case? Here is the law – if you are aware of a protection order and you possess a concealed weapon, even if there is no evidence that possession of the knife was intended to harm the protected party, there will likely be sufficient evidence to establish that you may have committed the offense of Violation of a Protection Order as set out in Section 18-6- 803.5. (See law above). The elements of Violation of a Protection Order uses the disjunctive “or” in section 18-6-803.5(1)(a) to multiply the ways in which the law can be violated.. The law provides for alternative ways of committing the offense of violation of a protective order. By using the disjunctive “or” the law specifies alternative means of committing the crime and includes a prohibition that permits a violation of the law that does not require proof that the accused actually contacted the protected person. Put another way, while the provision has to have been intended to protect the protected person, there is no additional requirement that the offender’s violation of the provision was itself “intended to cause imminent danger to the life or health” of the protected person. A first-time violation of Colorado’s concealed weapon law is a Colorado class 2 misdemeanor that can be punished by a fine of up to $1,000 and up to a year in jail. A second or subsequent offense within 5 years is a Colorado class 5 felony. Penalties can run as high as three years in prison and a fine of up to $100,000. Colorado Criminal Law – Under18-12-105 – How Concealed Does A Concealed Weapon Have To Be? H. Michael works hard to get his clients the best possible results in and out of the courtroom. He has written, and continues to write, extensively on Colorado criminal law and he hopes this article helps you in some small way – Colorado Criminal Law – Under18-12-105 – How Concealed Does A Concealed Weapon Have To Be? 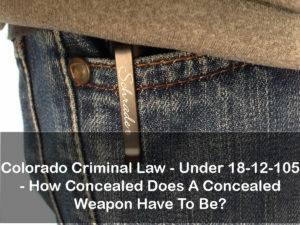 Colorado Criminal Law - Under18-12-105 - How Concealed Does A Concealed Weapon Have To Be? Under Colorado law - carrying a concealed weapon can act as a violation of certain Court orders such as a protection order. Understanding the intersection of the two laws is important to prevent new charges of Carrying A Concealed Weapon and Violation Of A Protection Order.